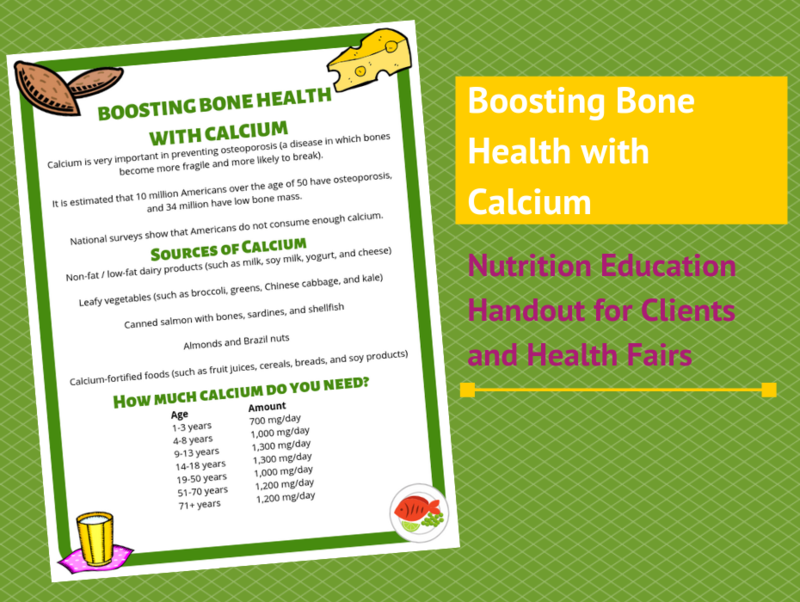 This handout contains basic information about calcium and bone health, including sources of calcium and the recommended amount to consume – perfect to pass out at health fairs and for client education! My name is Corinne Kantor, and I am the founder of The Food Cop and Diet Tech Central. I am a Registered Dietetic Technician, Certified LEAP (Lifestyle Eating and Performance) Therapist, and award-winning writer. I’ve been featured in numerous publications, including U.S. News & World Report, Parenting OC magazine, and the Orange County Register. My goal is to educate others about the importance of nutrition and living a healthy lifestyle. I especially enjoying educating others about clean, healthy food; edible gardens; and food sensitivities. A little more about my background…I have undergraduate degrees in Dietetics and Journalism, and I am also a certified U.S. Diabetes Conversation Map Facilitator. I have been the dietary supervisor at a skilled nursing facility, and I have also worked in the nutrition department at various acute care hospitals. My writing awards have been in the field of technical writing from the Society for Technical Communication.